After years of talking with companies about scaling growth, I decided to sit down and study how B2B companies that really scaled executed their go-to-market approach. So, about three years ago, I looked at what companies like Salesforce.com, HubSpot, and Marketo did to sustain such growth, as well as large companies that continued to grow and excel at sales side pursuits. The objective of my study was to identify if there was any commonality in the structures and behaviors used by these firms, especially ones used by them that were different than those implemented by small and mid-sized companies (SMBs) that don’t scale. While I knew I’d learn a lot through the research, I was actually blown away by the discoveries I made. Companies that scale approach things very differently from SMBs. They structure the sales side very differently. I shared the optimal structure in two previous posts – one highlighted on the overall sales force, and one focused on understanding the B2B lead generation model. What I found equally (or more) important was the mindset they had around the entire lead generation process. They know that you can scale growth without consistently and predictably multiplying the volume of leads they were generating. 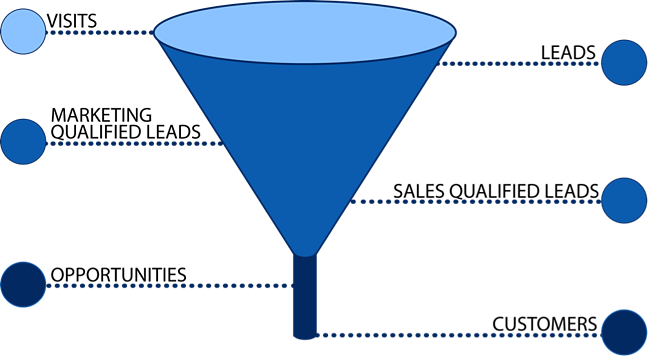 They embrace the entire sales funnel and realize that sales are the result of a fully functioning funnel. The findings I made during my research have guided the innovation at Imagine over the last three years. Today, I’d like to share the three mindsets that separate scalable companies, from those that never seem to get out of their own way. When you look at how a company that scales define the term “lead” they define it far more broadly than the majority of SMBs define the term. In reality, the SMB definition of a lead is far closer to the definition of a sales qualified lead (SQL) or a sales opportunity. An effective definition of the term “lead” is a quality visit or interaction. On your website a lead is someone who fills out a form and lets you know they’re listening. In outbound pursuits a lead is someone who is willing to engage in some level of conversation. At a trade show a lead is someone who leaves a business card (for a reason other than just wanting a chance to win a free iPad or trip). You’ll notice that the word “qualified” is not used in defining or pursuing a lead (more on that shortly). Don’t get me wrong, companies that scale growth are totally clear who they’re targeting, and have clearly defined buyer personas. If I’ve learned one thing implementing lead generation and management programs for companies, it’s that if I want to multiply the number of quality leads I create; I need to exponentialize the number of non-quality leads I create. The truth is that if your content isn’t attracting a student, a soloprenuer or a competitor trying to steal your stuff, then you’re not sharing anything worth paying attention to. It’s important to note a major shift here. Ten to twenty years ago, SMBs needed to manage the volume of leads they received. Back then every lead had an incremental cost, and their economic model couldn’t support attracting non-qualified leads. This resulted in defining leads (and the quality of those leads) by their proximity to the end of the sales process. This led to the flat funnels that dominate the SMB sales world today (see graphic below), and destroyed the structure for growth. As a side note, this is also where selling organizations lost their plot, and allowed themselves to be completely commoditized. This is no longer true. Managed effectively, leads have virtually no incremental cost and there is no longer any reason not to define the top of your funnel in the broadest terms that make sense. Companies that scale are on the leading edge of using technology to improve the efficiency and optimization of the lead generation, management and sales processes. However, they also know when humans are appropriate. They follow the Four Seasons philosophy: Automate the predictable, so you can humanize the unpredictable. They understand that marketing automation is a powerful force, but it doesn’t make up for having a strong strategy and clear understanding of the market. They understand the critical importance of sales and marketing alignment, and are always tweaking their approach to ensure that it aligns with how their customers behave. These 3 mindsets sum up the philosophy of fast growth companies. The most exciting part of my discovery was that the keys to scaling growth didn’t lie in raising money or building huge organizations. They’re strategies, structures and mindsets available to anyone with the commitment and discipline to implement them. Start adopting these mindsets and watch your growth rate soar.